With St. Patricks just around the corner, a little green was fitting. 1. Copper Earrings | Land(e)scape 2. 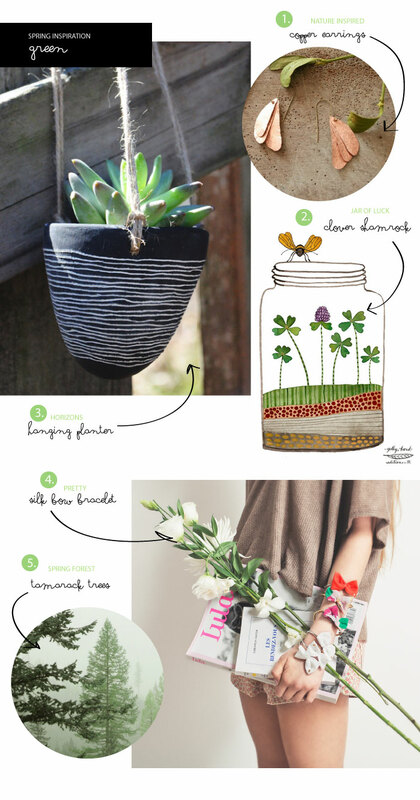 Jar of Luck Clover Shamrocks (Print)| golly bard 3. Horizons Hanging Planter | Half Light Honey Studio 4. Statement Silk Bow Bracelet | Noemiah 5. Spring Forest Tamarack Trees | Lucy Snowe Photography (All selected from our spring market at Poppytalk Handmade this month). I am a sucker for hanging planters. I buy them for outside, make them beautiful then promptly forget to water them. I'm not giving up, this one you posted is especially great! Perfect for this coming summer. This is a gorgeous collection! I love that dress. Thanks for sharing!